The Pentagon has made the Aegis ballistic interceptors a cornerstone of its missile defense system, and this week it successfully tested the second generation of the launchers. A target was launched Wednesday from a ground facility in Hawaii, aimed northwest into a broad expanse of the Pacific Ocean. The guided missile cruiser USS Lake Erie began tracking the target missile and quickly launched a new interceptor missile, the Standard Missile-3 Block 1B. The SM-3 tracked the target missile, adjusted its flight path and, at the right time, fired a warhead at the target, destroying it. A test of the same missile last September had failed. The Block 1B SM-3 has better tracking sensors and more control systems than its predecessor. 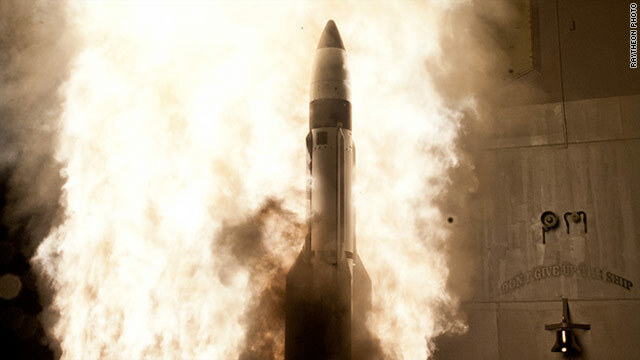 The test proved that this new version of the SM-3 could track and destroy longer-range ballistic missiles than the earlier Block 1A version. The United States has 23 Aegis-equipped warships deployed around the globe that would be capable of firing this new missile once the test phase is complete, which is expect by 2015. The fiscal year 2013 budget request before Congress includes a small increase in spending on Aegis missile defense programs over the current budget. Do not mean bad.Thank you so much! I just want to show some fashion , to all of you. I like , bsucaee wedding for a girl, it is the most special day in her life. Do you want to have the and in perfect day?? Here are the most popular and even for all of you. Also the and are a great choice for you. Let you dream come ture!! When you take part in a party, you can choose , also fashion but and here. Besides, the and are also provide to you! Уes yes, russians should be shot Putin like a dog, because he is selling his country's resources oil, timber and uranium. ask yourself, how many years of these resources are sufficient. Рower resources – that is why NATO is war around the world. And what's more, you have to spend $100 to get $1 of return with all their waste and corruption. this is good to hear... however – i think China is playing us.... just like we did the Soviets, when we convinced them we had a workable SDI system. China is great a making lookalikes like the J-20, but without the 5th generation engines and advanced avionics, its just a bluff. Their economy is strong – sure but they still have a very long way to go to match the US militarily. I am very skeptical about the Df-21 ...IMO its all part of that bluff...they are just trying to intimidate the west into inaction. This missile will only be as good as the cause for which it is used. And defending Israel is not one of them. Have the Chinese downloaded the design yet, or are they waiting till the testing is completed before doing so. A friend of mine was a pilot on a nuclear aircraft carrier and assisted in missile tests in which he towed a drone in his A6 for the missiles to shoot at. He was instructed to have the drone towed at 300 feet straight and level above the sea. He towed it instead at 100 feet and the missile missed- Guess who was blamed for the failure. So they did the test again, at 300 feet and the missile hit the target. The test was declared a success. We really must make sure that our enemies all fly at above 300 feet and straight and level. Do you know how long the A-6 has been out of service? Those kinds of targets are long gone. What you describe is decades old. The Navy uses to cruise missle surrogates, the BQM-74 which behaves like a subsonic sea skimming cruise missile, and the GQM-163 Coyote, which is a Mach 2.5 sea skimming target that behaves just like a Brahmos or Moskit as exercise targets. These are shot down routinely in exercises. A lot has changed in the Navy in the decades since your friend towed those targets. There is a whole new generation of missiles and radars. I think this is a great achivement for the US navy. The ability to shoot down incoming missles will make the United States a safer place and neutrilize the threats posed by rouge states like North Korea and Iran. Also it will gives us the ability to check aggresive nations like China who use their military as a means to impose their will over the region. "The SM-3 tracked the target missile, adjusted its flight path and, at the right time, fired a warhead at the target, destroying it." Nice to have such informed and well-educated reporting, clearly they are confused about whether the SM-3 is a missile or a radar. Makes no difference, all of these tests are bogus anyway since the test scenarios are oversimplified and not representative of the real challenges to be overcome in an actual attack, doing things like positioning the ship directly underneath the target flight path. @NN, It seems obvious to me that the SM-3 missile has the technological capabilities of identifying, tracking and destroying ballistic missiles in-flight without the need for a ground-based RADAR system. Can you elaborate on the test firing in greater detail, since you claim to have knowledge of the testing environment? From that description you can see that the ship's radar guides the missile in-flight to the intercept point until it is close enough for the warhead infrared seeker to pick up the target. Both of you are wrong. The enemy missile can be tracked by the ship's AN/SPY-1 radars, the big Cobra Judy radar, or the AN/TPY-2 used with ground based THAAD batteries. The missile launches to a point in space determined by the ship's fire control system, and navigates using inertial navigation, with mid course updates data linked to it through the launch ship's AN/SPY-1 arrays. When the missile is out of the atmosphere it uses an infrared seeker to find the target and complete the attack. Remember even a simple fly has very fast updates to it's eyes,and brain, and they have many eyes too...and a simple fly can see each of the 30 frames per second on our older tube TV's..so when you swing at a fly, they see it coming from a mile away.. This is not aimed at ICBMs. It is aimed at the DF-21's of the world, IRBM's in the hands of the Chinese, Pakistanis and Iranians. At those it is very effective. ICBM's are still too fast and high flying for effective sea based defense I believe. The Chinese claim to have a version of DF-21 with an anti-ship capability, though no ballistic missile has ever demonstrated any ability to hit a moving target. The Chinese assert it can do it and the USN has to have a response. This is part of it. It makes no sense to wait until China demonstrates it can hit a moving target to start working on the countermeasure. It takes too many years to develope such weapons, and that long a window of opportunity gives China too much incentive for mischief. Consider what is going on right now between China and the Philippines. Who knows where this will lead? How many times, and time spent have we been in space? We own the world! How many countries have space shuttle programs for more than 2 decades? Do u think we are growing grass up there? just my opinion. Robbie, many years ago towards the end of the Cold War we signed a treaty with the old USSR called the Intermediate Range Nuclear Forces Treaty. To comply with that treaty we retired the Pershing II missile and the USSR retired their SS-20 missile. Only two of each remain, one each on display in Moscow and the other pair at the Smithsonian. DF-21 is pretty much an enlarged copy of the Pershing II. The Chinese have passed the technology along to both Pakistan and Iran. Now all three have IRBM's and at least China's are known to have some terminal guidance and ability to maneuver, just as Pershing II did, to improve their CEP over a fixed target. Now the Chinese claim, with no testing we are aware of to back this claim, that such a missile could find and hit a ship at sea. The Chinese arm these with both conventional and nuclear warheads. Meanwhile, we are still bound by that old treaty with the Russians and cannot legally build our own IRBM's to threaten the Chinese with. The Chinese can legally build a Pershing II copy but we cannot legally build the real Pershing II. That means you have to be able to shoot theirs down if you want to make their IRBM force ineffective. The treaty also bans cruise missiles of a certain range and the Russians accuse us of ignoring that part of the treaty, which may be true. Accurate ranges of our weapons are not published. Pay attention to what is happening between China and the Philippines. If China prevails, they have claims on Japanese and Vietnamese territory. China seems determined to lock everyone out of the South China Sea regardless of what international law says about it being international waters, and this will inevitably lead us and the Japanese into conflict with China. Stealing my moniker, fellow dweller of Valhalla. It's actually bad, as it forces the Russians to create ever more deadly warheads. @Thor, if you look at weapons technology over the last three millennia, weapons technology has continually developed as a reactionary behavior to eliminate or marginalize an existing threat. The "have the biggest stick" mentality is an aspect of humanity's self preservation that will never stop. This is just the latest in an endless string of advancements that keeps the balance of power in the U.S. favor, and will certainly not be the last. The key to keeping the human race alive right now and in the future is that the major powers all have the capability of mutually assured destruction (MAD), which is the concept that if one power used its destructive power, the other power(s) could simultaneously destroy the offending power. It's the only thing that prevented the Cold War from ending the existence of the human race. With modern energetic materials, heavy penetrator warheads and the latest precision guidance nuclear weapons are almost no longer needed in warfare. They are, at best, a terror weapon held in reserve against your country being wiped off the map. They are unnecessary for tactical warfare. What that means is that nations can conduct wars for limited objectives without the need to escalate to a nuclear exchange. It is, in fact, possible to deplete an enemy's nuclear arsenal using only conventional weapons. Precision guidance and big penetrators make blowing lids on enemy silos with conventional ordnance quite doable. Having a nuclear arsenal is no guarantee of anything any more, especially if your launch platforms can be found. If they can, they can be destroyed with conventional arms. Well, another round of cold war. greeting to Bush. and now we doing back how the evil empire. thanks from Russia. Wrong! Putin has discovered the ultimate weapon, gas and oil! He has no need for sophisticated weapons systems! Every gas valve leading out of Russia crosses his desk. All he has to do to bring down countries is turn off a valve. He has done it before, and will surely do it again. He has suckered Germany into relying on his cheap and plentiful gas. See what happens to Germany when Putin decides to cut off their gas! He can do it in an instant. Remember, Putin is not just a politician. He is a very intelligent and well trained former agent of the KGB. His training is far superior than anything the West has ever done. Why do you think he recently was elected back into the Presidency. There was never any doubt he would win.